Onychomycosis (also known as "Dermatophytic onychomycosis,Ringworm of the nail, and "Tinea unguium)" means fungal infection of the nail. It is the most common disease of the nails and constitutes about a half of all nail abnormalities. Personal experience, I had suffered from this disease some 3 years ago. I took pill (Turbanafine) and used cream (clotrimazol) for 6 months. 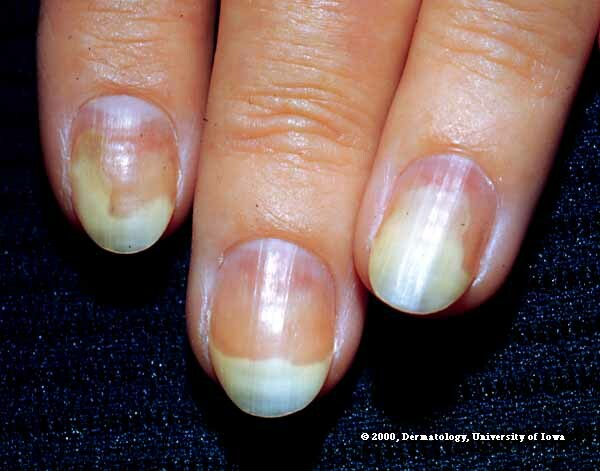 I often warn clients about this when they have Onycholysis (distal end of nail, white tip has irregular border where it joins the pink, white end starts to travel down the nail). This is due to nail starting to separate from the finger at the tip due to varous (often trauma) reasons eg typing with nail tip instead of finger pads, poking metal objects down the nail tip to clean it, or hands often in water or chemicals... etc. It can be a precursor to bacterial or fungal infection if they don't take care of it - i.e. keep nails dry & clean, cut nails to reduce trauma etc. Once fungal infection takes hold, it can be very difficult to get rid of & cause horrible nail deformities. It's very late now, will try to post some example pics over the next few days. I know it is not the same that Asif is talking about, but I include it in this thread as it is a warning sign. Notice how the white tip of the nail has eroded down into the pink area. Once the nail starts to separate from the finger like this, if neglected, it can become infected and lead to bacterial or fungal infection eg Onychomycosis that asif posted. Hello Lynn, thanks for posting precious information. It was my personal experience that in my left palm sun finger was infected with fungus some 3 years ago and fungus started by white spot and gradually change the color and at last stage color converted from white to light green. hi Asif, thanks, I should have said - not all fungal infection of nails begins with Onycholysis. Lynn wrote: hi Asif, thanks, I should have said - not all fungal infection of nails begins with Onycholysis. Thanks Lynn, you are right and have deep experience. hi! i know it's kinda late but what's the best way to treat this? i heard fungusil works well. are there also home remedies? thanks! TylerFreeman wrote: hi! i know it's kinda late but what's the best way to treat this? i heard fungusil works well. are there also home remedies? thanks! I would advise against home remedies as they are not effective enough. Mine condition was not severe - similar to 1st picture on this page http://www.treatmentforonychomycosis.com/onychomycosis-pictures/ and it took me 9 months of systematical application of topical treatment product to cure it. I would say go to GP and see what he prescribes, otherwise you will just waste your time and the condition get worse. My husband's finger nails looked like the pictures shown. Several doctors said it was fungus but after hearing of the risks in taking the medication, he kept seeking other medical opinions. He finally was sent to a specialist who took a sample from under his nail and it turned out not to be a fungus but psoriasis. It is best to have a possible fungus properly diagnosed as the most commonly prescribed fungicides are not without some risk in taking them. A person needs to ensure that their liver is healthy enough to take the medication and needs to be monitored while taking the medication to ensure there is no damage occurring during treatment.